10-1:00 Meditation, Italian, Workshop with Rae Dunn: Visual Travel Journaling. A peek into Rae's process and her delightful one-minute-sketches with watercolor. Rae has a new book coming out of her gorgeous sketchbook from her artist residences in the south of France! We'll continue throughout the retreat to fill our own. All materials included. FREE TIME to relax or explore on your own -or- *Optional* Visit another side of the island, Pollara, where Il Postino was filmed! Lunch with a sea view at the popular l'Oasi cafe, stop for a peek into the town church, & take a nice walk down to the cove for a swim at the rocky beach. Meet at Al Cappero (at a caper farm!) in Pollara for dinner. 10-1:00 Meditation, Italian, Workshop with Diva: Brush Lettering & Intuitive Design: The art of brush-lettering, designing motifs inspired by nature and the island, adding color. All materials included. FREE TIME to relax or explore on your own -or- *Optional* Visit Santa Marina, the port town, for lunch and shopping at the local boutiques filled with local art, ceramics, and other charming gifts. Take breaks for gelato, a granita, or to walk along the marina. Meet for dinner at Trattoria Cucinotta in Santa Marina. 11-5:00 Boat tour and day trip in the islands, lunch at Da Alfredo (Bring your sketchbooks to continue filling your visual travel journal! ), visit secret swimming spots. FREE TIME (dinner/evening out) *Optional* Dinner at La Pinnata del Monsu, known for their fresh seafood and outstanding cannoli. 10-1:00 Meditation, Italian, Workshop with Diva & Rae: Designing your creative life & creating your dream project! All materials included. Feedback & reviews with Diva & Rae. FREE TIME to relax or explore on your own - or- *Optional* Take a spa day at Signum! Book a treatment, enjoy the natural thermal baths, or lounge by the pool with an icy drink. Grab lunch in town, walk down to the rocky beach of Malfa for a picnic and a swim. 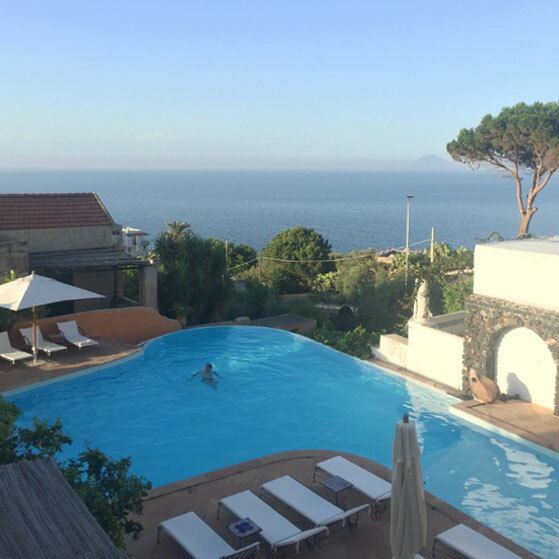 A five night retreat in one of the most beautiful spots in the world, on the mediterranean Aeolian Island of Salina in Sicily, Italy-- and staying at Hotel Signum-- a magical place I swore to return to one day!! I designed this retreat on the sparkling Mediterranean to rejuvenate & inspire, to connect creatives while making time for self care. Our mornings will begin with a luxurious breakfast, followed by a meditation, a short Italian lesson, and a slow art workshop. The workshops will be led by Rae Dunn (Slow Travel Sketchbooking), and myself (Brush Lettering, Inspired Design & Pitching Your Dream Project). In the afternoons you're welcome to take time for yourself or to join the group for optional excursions exploring the island (hiking, shopping, wine-tasting, swimming, etc.). We'll meet again for drinks & dinner out at lovely restaurants, sampling the local fare with stunning sea views. On Day 4 we'll see the islands by boat, stopping at secret swimming spots and for lunch at Da Alfredo (the BEST granita in the world!!). Our last night we'll have a decadent farewell dinner at the exquisite Michelin starred Signum restaurant. To reserve your place you can pay the total amount (non-refundable) or give a $1500 deposit (also non-refundable) to be paid in full by April 1st.